Hi, my name is Grace and 47 years ago I moved here to America with my husband, Henry; son, Sam; and daughter, Sarah, from South Korea. I remember – in South Korea – the blossoming Cherry Tree in the courtyard and all the dogs sleeping, like they always did. The room that we always held our parties and weekly dinners with friends and family in. The streets still made of stone and everyone walking, yes walking, for there were almost no cars in our little town. You’d walk for five minutes and then you’d get to the market or the apothecary where everyone’s face was a familiar one. Nothing was ever too crowded, unlike today. When you visit you see doll-like young women and teenage boys with too much makeup. Everything is so busy and crowded with technology and everyone has so much hate. 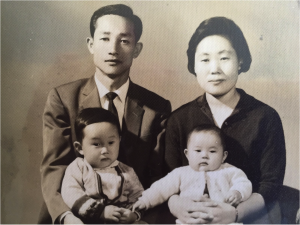 My husband Henry studied in Korea to be an engineer and work for the government, but then he ended up winning a scholarship from the Korean government allowing him to study anywhere he wanted in the world on full tuition. He chose Stanford all the way in Palo Alto, California. He loved the United States so much and he had talked about moving there since his last trip when he was invited by the Korean government to study in America for a while which he gladly accepted. He came back with stories of so many different people and places. People were so nice to him and they respected him so much, and let’s just say he loved the attention. He liked the big cities and all the technology and all the comedic and dramatic American movies. After Henry graduated with first a masters, then a PhD, he was offered a job at Stanford, working for the Stanford Linear Accelerator Center, as a design engineer,a position he excitedly accepted. By this time Sam was 4 years old and Sarah was still 1, and together we decided that they were going to grow up in America. We thought American Society would be a nice, friendly and easy place for them to develop into adults happily with lots of opportunities. On October 18, 1969, I boarded the plane to America with Sam and Sarah, anxiously awaiting what was to come. Our plane ride was 14 hours long with an almost 20 hour stop in Japan, which allowed me to visit some friends before reaching our final destination. Now it only takes about 12 hours to get from Korea to America and 13 hours to get from America to Korea, depending on the weather. We finally arrived in the San Francisco Airport – welcomed by Henry who was smiling as usual – and lots of friendly American strangers. We first lived in an apartment in Mountain View for a few years, then we moved into a house in Palo Alto for another few years. After that we lived in a house in Mountain View for almost 25 years and eventually retired in Santa Rosa California. Coming to America I already had some good friends living here including an elderly couple, and of course Henry had lots of friends, so we were very welcome no matter where we were. We felt so happy to be in America because everyone was so friendly and no one gave us a bad impression. I missed my family in Korea though, I was very close to them. My eldest brother was a civil engineer and designed most of the roadways and transportation systems in Korea as well as a number of other government projects. He also founded a construction company, and when he retired he became a lecturer at many universities and also the author of different books in Korea. He is considered a very honorable person in Korea now as is most of my family. My little brother majored in law and gained a very high position as a judge for the Korean government. He later started his own law firm which is now the biggest and most powerful in South Korea. This gave him a very powerful position in Korean Society and he has become also very well respected member of the Korean community. Last, but not least is my younger sister who is married to a professor of dentistry, who is now retired and a lecturer. When he was working he not only was a professor, but also held the highest position in the school for a long time. My sister is a very nice, lively person and she loves being around people and having parties, but before she was married she had graduated college with a masters degree and had planned on becoming an instructor. She later decided that she wanted to stay at home instead and raise her children and grandchildren. Another challenge we faced was the education system here in America. Back home in Korea, you had to work extremely hard and you were always doing homework. In school Sam and Sarah went through the public school system of Palo Alto which was good, but we never felt like they were being challenged. When we asked about maybe taking them to a private school instead they insisted that it wouldn’t be any different. People who were immigrants, Jewish or special needs were often the ones sending their children to private schools and we wanted to be normal americans and give our children a normal childhood, so they stayed. Now I have started working for a company again. For a long time Henry was the only money maker and I was the one taking care of the children, but I actually really loved to work. I wanted to see what the work community was like in America and how it had changed over the years. The only time I worked in America was from 1970-1994. Now besides working I focus on my many different hobbies including painting, gardening, music, sewing and writing. I also continue to do lots of charity work for my church which is something I’ve done for a long time and always loved. The interview with Grace and the written account were done by her granddaughter, Rachel Kang, a 9th grader in Redwood City.